On September 16, the California Supreme Court refused to hear the appeal of Anthony Beninati, who blamed promoters of the Burning Man festival for injuries he sustained in 2005. Its decision affirmed that of the Court of Appeal, which ruled against Beninati earlier this summer. See "Man Burned at Burning Man Assumed Risk of Being Burned by Burning Man, Says Court," Lowering the Bar (July 2, 2009). 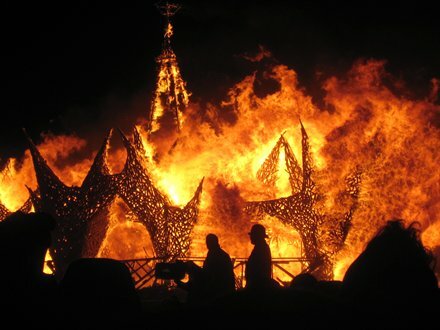 As you may recall, Beninati had walked in among the remnants, some still burning, of the Burning Man, the 60-foot wooden effigy that is burned at the end of the festival every year. Beninati then tripped over something and fell into the fire. He sued Black Rock LLC for his injuries, saying it had negligently allowed people – including himself – to approach the fire (or even, let's say, walk inside it) without safe pathways. By applying the "assumption-of-the-risk" doctrine, however, the Court of Appeal held, essentially, that the risks of walking inside a giant bonfire are sufficiently obvious that others have no duty to protect against them.